Can behavioral science help us learn how to respond to conflict so we can be happier and more effectively help solve our problems without getting drawn into unnecessary drama? Yes it can and Jennifer Hancock, author of several award winning books and founder of Humanist Learning Systems will teach us how. She specializes in humanistic management and programs focused on how to stop bullying and harassment using science. Her insights on how to combine philosophy and science to help solve our problems more effectively have helped countless people all over the world. This program is based on behavioral psychology and discusses how your responses impact other people so that you can choose a response that will help you stand your ground while still being compassionate about the problem that needs to be solved. 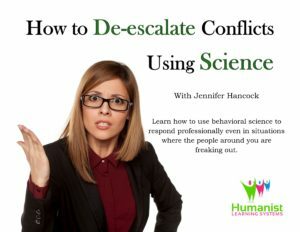 The goal of this program is to help you learn how to use the science of behavior to respond professionally even in situations where the people around you are freaking out. Jennifer Hancock is a mom, author of several books and founder of Humanist Learning Systems. She is considered one of the top speakers and writers in the world of Humanism today. Her insights on how to combine philosophy and science to help solve our problems more effectively have helped countless people all over the world. Jennifer’s approach to stopping bullying and harassment is unique. She specializes in teaching a behavioral approach to harassment problems. Specifically focusing on how unwanted behaviors are extinguished. There is more than 70 years of research on how to extinguish unwanted behavior and what is known has a direct impact on why harassment and bullying are so hard to stop and why attempts to stop it result in retaliation. Retaliation is predicted to occur in the behavioral model and it’s time we start taking that into account in our approaches to making it stop. Harassment is a behavioral problem and it requires a behavioral approach to stop. This is a 1 hour online program. You can study at your own pace but still have access to the instructor to ask questions, interact with your fellow students and more. All participants will be required to take an online test to receive their certificate of completion. To participate in this course you will need Internet access and the ability to view youtube style videos. The course will work on home computers and tablets such as the iPad.